It is December and it is cold outside!! I love curling up in front of the fire with a good movie or a good book. I don’t usually have teaching work in December, but this year I am teaching a week long workshop for the Hudson River Valley art workshops in Greenville New York. Stitched paintings which makes me doubly excited as I get to paint along with the students and the Greenville Arms is one of my favorite places to teach. And a great place for the students to take workshops, very homey bed and breakfast with Mark the greatest chef who keeps us full and entertained. I am working on a commission to keep me busy the rest of the month in between shopping and enjoying the season. The Year Is Half Over Already! July, 2015: 4th of July!! The year is half over already!! I was hoping to be moved out to California by now but the market is not going as fast as I had hoped. So My beautiful home with a quilters studio, open floor plan, manly shop and guest house is still for sale. Google 235 Rancho Alegre Rd, Santa Fe, NM 87508 and maybe you would like to move to Santa Fe and live on this lovely property. My family reunion was so much fun here in Santa Fe. Made me miss them all the more and pray for my house to sell soon so I can be closer to them. I got a note from my first photographer ever, Lindsay Olsen and we were reminiscing how over 30 years ago he began taking pictures of my “rugs” as he affectionately calls them. He has moved and down sized and I had traded him one of my first art quilts and now he is hoping to sell it to someone with some wall space to display it. He is asking $5,000.00 for it, if you are interested let me know. Cosmic Kaleidescope 50″ x 59″ was a favorite of the time (1980) and was started in a workshop with Jeff Gutcheon. 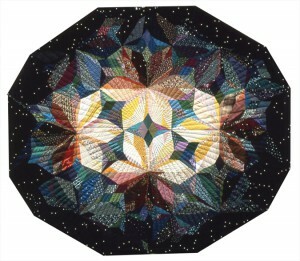 of classes then home for a week then off to Quilting by the Lake in Syracuse. 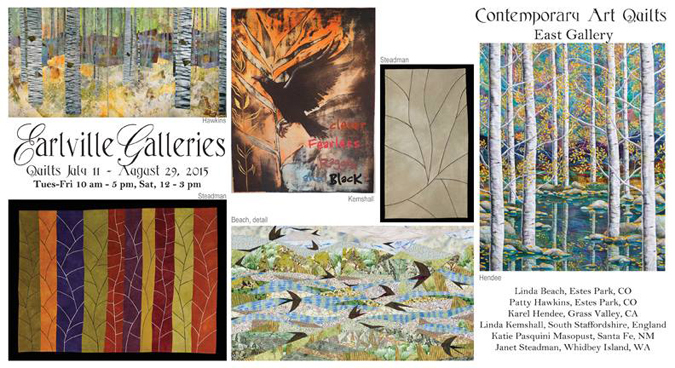 Both venues I am teaching working in a series so I am very excited about that. June, 2015: We had a great Memorial Day weekend up in Northern California with my sister and my cousin. 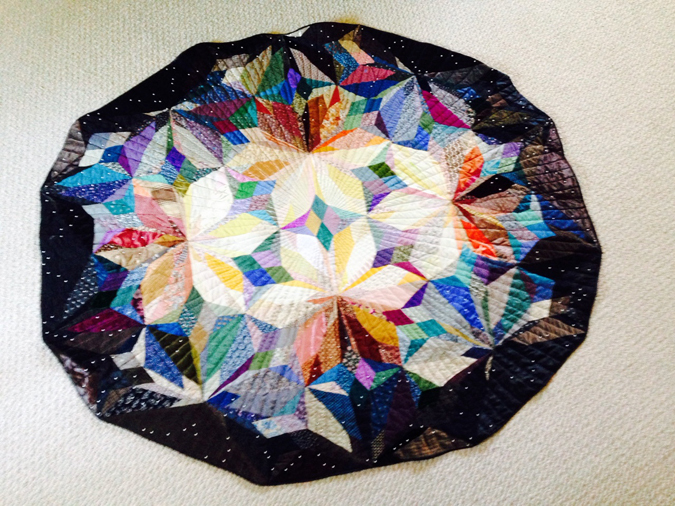 We call ourselves the Twisted Sisters Log Cabin Quilters. So fitting on so many levels. 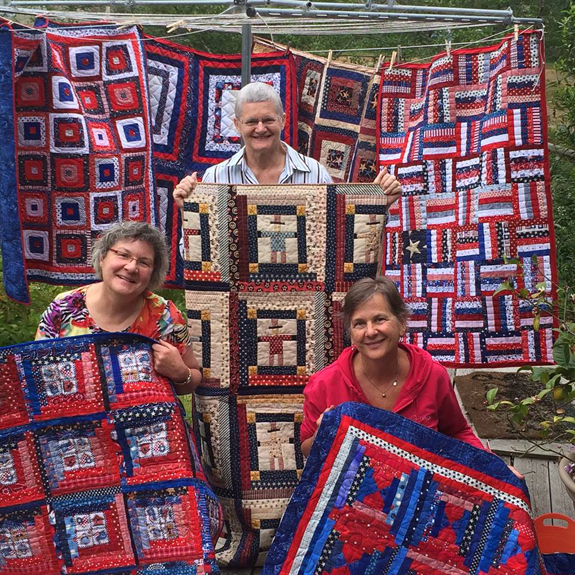 We get together several times a year to make log cabin quilts together and on Memorial Day we make red white and blue patriotic quilts to give to our veterans to thank them for their service and to help them with their life. It is really fun and we do it to honor my Cousin Holly’s husband who was a Navy Seal and passed away three years ago. His Birthday is on Memorial Day weekend so several honors there. We started on Friday night and ended Tuesday morning when we delivered 7 totally completed quilts from cutting to binding!! To the Veterans office at College of the Redwoods. We even got to gift one of them to the vet who works in the office. He was pleased and we were proud. 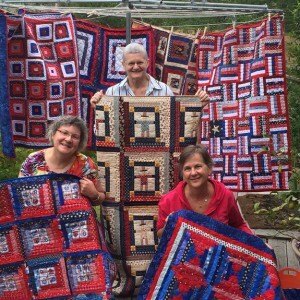 Here is a picture of the three twisted sisters with our 7 patriotic quilts. In June I have new classes started for MY on line courses. 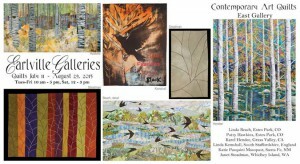 Color Composition and Design starting June 25th and Working in a series starting June 18th. For more information go to the on line classes pull down tab and sign up it is educational creative and fun. Join us! I am also going to be in two on line video classes with I Quilt. I created one video on color and another on my new class Artful Log Cabins. In order not to miss either of my classes or any of the other wonderful classes they have to offer go to www.Iquilt.com and register with your email and they will send you notice of when things are starting. They have a really great line up of educational fun programs for you. Alegre retreat was held in April and it was a huge success. We are starting to take sign-ups for next year when we will have Nancy Crow teaching a 7 day class and Rosalie Dace, Cynthia Corbin, Gregory Case and myself teaching 5 days. We are over half full at this time. To find out more about Alegre Retreat go to the web site www.alegreretreat.com and to www.gatewaycanyons.com to learn more about it. Then think about joining us as it is a really grand time. There are two YEA scholarships available for those who want to attend that will be under 30 years of age at the start of the retreat which is April 18th. There is one General Scholarship for any age. The deadline to have your information in is October 15th. I am off to teach my Artful Log Cabin class in Greenville NY at the Hudson River Valley Workshops. One of my favorite places to teach!! So fun fun fun!! Then I come home and on the 25th we have our family reunion and everyone is coming to Santa Fe. So very much fun will be had by all. I hope you have a happy and creative summer.